Throughout this past RBI season, there were many bright spots and moments to be remembered. Outstanding performances during the regular season; nail biting pitching duels in the wood bat tournament, and gutsy performances at regionals by all three of our All-Star teams. The Senior team attempted to make a return appearance at the World Series, but found their bats to go cold at inopportune moments. The Softball team made positive strides from last year, but again fell short to defending regional champion Tampa. This year’s standout team was our Junior All-Stars who dominated Regional play on their way to the 2009 RBI World Series, presented by KPMG. 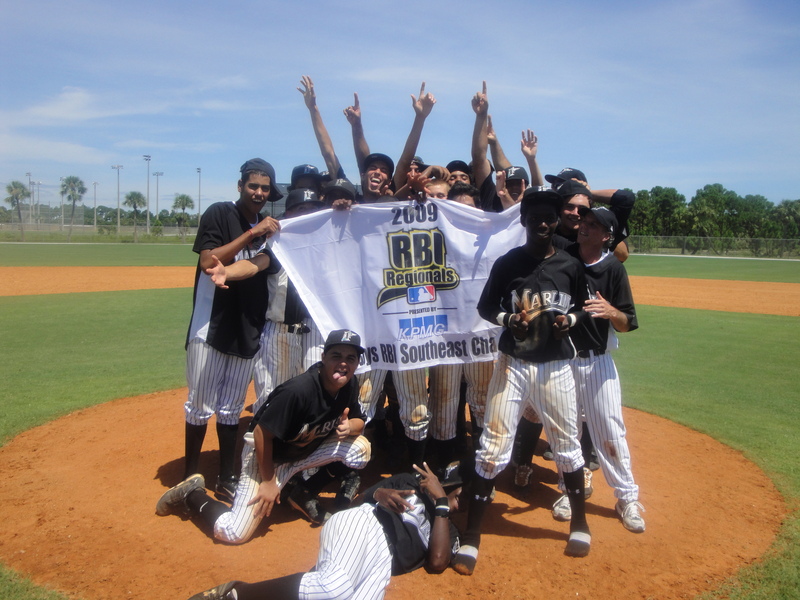 At the World Series, Miami Juniors represented the Southeast region, and went 2-1 in pool play. They began play by taking on Cleveland and immediately falling behind 3-7 before eventually using their speed to help erupt for a seven run inning behind the bat of Demetrius Morrer who had a game high 3 RBI’s. This was a confidence boosting performance to begin the tournament; an impressive 10-7 come from behind victory. Later in the afternoon, fresh off their first victory, Miami had the challenge of taking on defending champion Detroit. After falling behind 1-3, Miami was able to tie up the game led by two hits off the bat of Demetrius Morrer. Inning after inning goose eggs were thrown up on the score board by relief pitcher Williams Durrothy who fanned seven hitters in three inning of work. However in the top half of the seventh, Detroit proved to be too much and scored the final two runs of the game, ending the Juniors day with a split in pool play. The last day of pool play arrived and Miami had something to prove. With a favorable seed on the line, the Miami team showed off the offensive prowess that helped make them Regional Champs. A convincing 17-7 onslaught ensued, where they never trailed once they came up to bat. A performance of both speed and power displayed what a balanced offense is capable of, led by the three, four and five hitters, Carlos Sosa, Gabriel Valverde and Andres Sanchez, combining to go 7-for-12 with a home run, nine RBIs and three runs scored in its route of Cleveland.. The boys were prepared to go into elimination day with momentum on their side… at least that’s what one would have assumed. Pool play was over and when the brackets came out, Miami was pegged to go up against Montgomery. Once the game began, it was an uphill battle, as Miami fell further behind after every inning. For whatever reason, every pitcher who took the hill could not command the strike zone. That combined with subpar defense led to a first round exit after a 12-1 defeat. The Miami Marlins had played their final game of the World Series, and despite having exited in a way that was both shocking and disappointing, their presence was at the World Series was certainly noticed and other teams new that they hadn’t seen the last of Miami RBI.